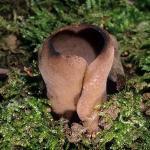 Head of the fruit body 4-7 cm high, 3-5 cm broad, convoluted and irregularly lobed, sometimes saddle-shaped; margin attached to stipe at several points; flesh thin, brittle; hymenium grey-black to black, sterile inside tissue grey to dark grey. Stipe 3-15 cm high, 1-3 cm broad, equal or tapered, deeply furrowed longitudinally, lacunose; chambered in cross-section; surface smooth, white to grey to dark grey. Spores 12-21 x 12-14 µm, oblong-elliptic, smooth; hyaline; with a large central oil drop. Solitary to gregarious under trees, winter to early spring. In our area it is most common under pine. 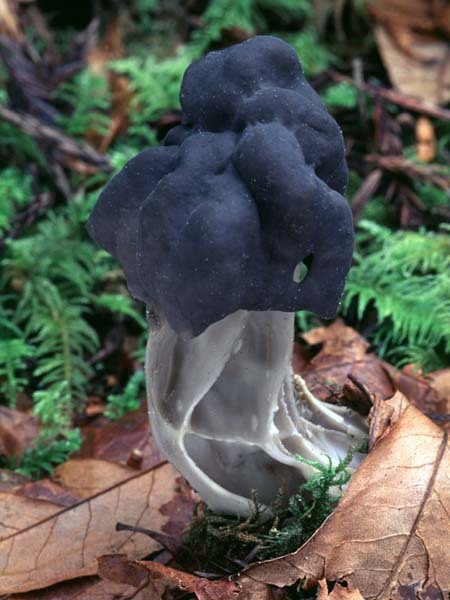 A common mid-winter mushroom, Helvella lacunosa is variable in form and color, but its deeply furrowed stipe and dark, convoluted cap are distinctive.